Imagine having the skills to resolve conflict and confrontations quickly, easily, and considerately as possible. 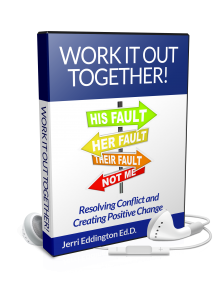 No matter how hard we try to avoid tensions at work or at home, disagreements are inevitable. They may seem to appear out of nowhere, but one thing is for sure – they won’t go away or get better on their own. • Achieve a greater sense of overall peace, confidence and integrity. • Come to a better understanding of the causes of conflict in your life. • Learn to recognize, prevent and resolve conflict quickly and effectively. • Deepen your connection with friends, family and even total strangers. • Improve your relationships with those who are most important in your life. Complete the form below to claim your FREE Audio Series: Work It Out Together!